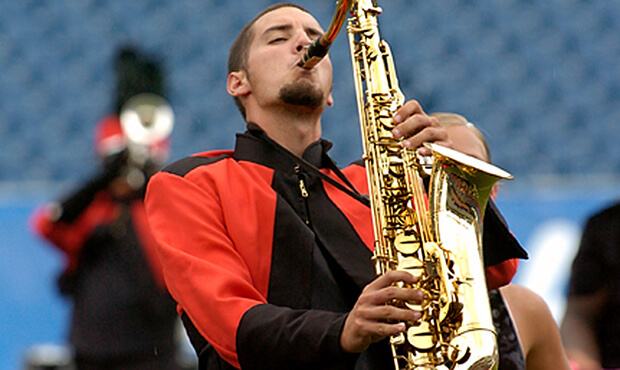 The 2005 Drum Corps International World Championships were held in Foxboro, Mass., 11 years after DCI's first and only other visit to the Boston suburb. During the interim, Gillette Stadium replaced the substantially smaller Foxboro Stadium, amplification and any-key brass was legalized in the DCI rulebook, and color guard finally received its own judging caption. The Colts hadn't been finalists since 2001, and hoped that 2005 would be their year. Despite finishing just below the cutoff in 13th place, the corps had much to be proud of. To place 13th, the corps had to switch positions with the Crossmen, who slipped out of the Finals competition for the first time since 1989. Sitting in 24th place at the end of the Quarterfinals competition were the Kiwanis Kavaliers, at the conclusion of the corps' 30th anniversary season. The Canadian corps had long been considered one of DCI's most international groups, having hosted members from more than 20 countries across both the Atlantic and Pacific Oceans. The corps entered competition in 1977 and had finished as high as 14th place in Division I (now called World Class) in 1996 with a "West Side Story" production and again in 1997 with "Evita." They came from Kitchener-Waterloo, Ontario, long a hotbed of drum corps action. Fellow local corps Dutch Boy made it into World Championship Finals in 1990 and another local group, Ventures, had placed first or second 11 times in DCI's Class A and/or All-Girl Class competition. "Mission Accomplished" was the theme of the Kavaliers' 2005 production, a crime-solving mystery full of intrigue that was generously sprinkled with humor and recognizable melodies. No less than Earth's destiny lay in the balance, so the bumbling Inspector Jacques Clouseau from the series of "Pink Panther" comedy films was called in to make the world safe for all. Nine films in the "Pink Panther" series had been introduced by the time of the Kavaliers' production. Six of those, reaching back to 1963, starred Peter Sellers, who is the actor most connected with the franchise in the minds of most theatergoers. Corps designers set up "Mission Accomplished" as a suspenseful whodunit, sprinkled with humor and whimsy. The production kicked off with Michael Giacchino's "The Glory Days," from the 2004 animated smash hit "The Incredibles." Giacchino, whose name may not be as familiar as other film composers, cut his composing teeth writing for video games and has been heard supplying the background music to the television series, "Lost," as well as an assortment of movies as varied as the 2009 reboot of "Star Trek," and the animated hits "Ratatouille" and "Up." Next the corps performed "Secret Agent Man," written by P.F. Sloan and Steve Bari and made famous by the 1966 Johnny Rivers recording for the American broadcast of the British spy series named "Danger Man." The color guard members wore long trench coats to portray the secret agents. Henry Mancini's "Pink Panther Theme" was based on the Bobby McFerrin cover of Mancini's instrumental composition for the 1963 film of the same name. During this segment the color guard members spun props resembling the pink tails of the animated character who opened up the films. In a comedic moment, a brass soloist kicked away a saxophonist who was ready to play. It was a tenor saxophonist who played the musical theme in the opening title sequence of the film series. A hand bell feature opened the next piece "Betrayal," written by film composer Danny Elfman for the 1996 spy thriller, "Mission Impossible," starring Tom Cruise. The color guard members employed various colors of stretch fabric to hide behind, as if trying to stay in deep cover, working to avoid being discovered as spies. Elfman struck it big writing for smash films by Timothy Burton, a personal friend. These included the soundtracks for "Pee-Wee's Big Adventure" and "The Nightmare Before Christmas." He originally balked at writing the "Pee-Wee" music because he had no formal training in composition. Corps arranger Jason Logue wrote the ending musical tag to "Mission Accomplished," which brought to a close the corps' 2005 production as well as its final season on the field before disbanding. For this week only, you can save on the DVD that contains this complete Kiwanis Kavaliers performance, along with all corps from the 2005 DCI Division I, Volume II disc. Buy the 2005 Division I Volume II World Championships DVD. (Available this week only for 20% off. Regular price: $29.95.) Discount DVD offer ends Monday, March 17.